In the last two weeks the respective chamionships that we have been majorly involved in this year have had their end of season prize givings and our customers featured in all 3 of the biggest championships in the UK. After being runner up in the 2013 Reis Tarmac Rally Championship, Paul Bird set his sights on the BTRDA gravel championship for this year with his Cockspur Rum and Frank Bird Poultry backed Ford Focus WRC. A very strong season saw him finish on the same points as the championship winner but lose the championship due to a tie-break. Co-driver Aled Davies did however seal the Co-Drivers championship. They ended with 3 wins in the championship, 2 second places and 1 third place. A broken driveshaft causing him to retire on one rally. Paul enters Rally Barbados every year and was going for his 3rd win in as many years so missed out on 2 events in the championship. Unfortunately he didnt manage to seal the 3rd Rally Barbados victory. Whilst leading quite comfortably the team clipped a rock on the inside of a corner and caused too much suspension damage to continue. 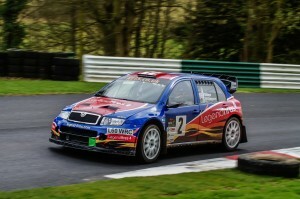 John Stone has had a very successful year in his Legend Fires shod Skoda Fabia WRC. Entering the Reis Tarmac Rally Championship as he has done for a few years now he started the year very consistantly with 2 fourth place finishes and a fifth place before stepping up the pace and claiming second on the Irish stages of the ALMC Rally in Dublin. Another fourth place on the ranges in Otterburn saw his year championship prospects looking very strong. He and co-driver Carl Williamson missed round 6 at Mewla but were back on the podium in Wexford claiming third. The Legend Fires team headed to the Cheviot Keith Knox Rally, the final round of the year with no chance of winning the championship but needing just to finish 4th to secure second in the championship. Having had 100% finishing record with the car so far in the year John was confident the car would make the finish so drove a sensible and consistent rally finishing 3rd to ensure that he did finish the year with a very good 2nd overall in the championship.We have had cars in the Scottish Championship for many years now and this year was no different. Dale Robertson took his Mitsubishi Lancer Evo 9 to all but one round. Despite a hard beginning to the season where he found himself slightly off the pace he had expected to be on he proved that as long as you are finishing rallies you are still in the hunt for the championship. Missing round four due to having a wedding to attend. He returned to the rally scene and was on a completely different level. Setting consistant top 5 stage times and claiming a few class wins he found himself needing to win Group N on the last round to seal the championship. He did that therefore he and Tranent co-driver Paul McGuire were Scottish Group N Champions for 2014. Just like John’s Skoda, Dale had a 100% finishing record with the car on the SRC. Also in the SRC Kieran Renton with his Keith Renton Joinery backed Fiesta R2 had a good year. Entering the first few rallies in the R2 before we carried out the upgrade of the car to the R200 class. Setting some very good times throughout the year with Dave Robson in the co-driver seat using all his experience to help Kieran improve on every rally. His season ended with him 3rd in class 4 and 19th in the Scottish Championship and just missing out on the podium in the Clubman 2WD section of the SRC finishing fourth in that. Last year the Scottish Rally Championship was won by David Bogie in a 2002 specification Ford Focus WRC. His Focus’ engine was built buy ourselves in house. For the second year running now we have now built the engines of the Scottish Championship as we also built this years winner Euan Thorburn’s similar Ford Focus WRC engine. 2014 has been another successful year for us and we are looking forward to 2015 already with major rebuilds and checks being carried out on customers cars.